The 2012 Range Rover Vogue offers two new distinctive look with unique tailgate badging - Vogue Silver and Vogue Black. Both derivatives include the widely acclaimed Logic 7, 1200W Harman Kardon High Dynamics Audio System, heated and cooled seats for each passenger, and an 8-inch Dual View infotainment screen - allowing the driver to view the navigation display whilst the passenger can relax watching a video. The all-newVogue has three engine options to choose from: 4.4L TDV8 engine (313PS, 700 Nm torque), LR-V8 Supercharged engine (510PS, 625Nm torque) and LR-V8 naturally aspirated (375PS, 510Nm torque). The 2012 Range Rover consolidates its position as the world's most luxurious SUV with a host of style changes and feature upgrades, including new option packs for the Vogue and Autobiography models. 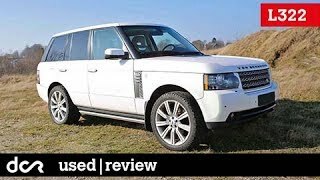 "The Range Rover always has been and remains the definitive, luxury SUV and one whose off-road performance matches its comfort levels and performance. 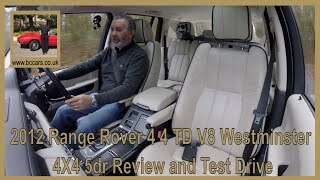 New equipment levels, revised styling and generously specified option packs make it the one to beat in 2012," says John Edwards, Land Rover Global Brand Director. The Range Rover exterior has been enhanced for 2012 with detail styling changes. Headlamp and tail lamp back plates are now finished in gloss black, while the front grille surround is finished in Narvik Black. Door handles and side vents match the body colour to create a modern, integrated look and new 20" V spoke alloy wheels finished in mid silver sporting a Range Rover branded centre cap, round off the changes to the exterior. The Grand Black wood veneers on the 2012 Range Rover now have a crisp inlay which reads 'Range Rover'. Autobiography veneers are available in a choice of Burr Maple Prussian Blue, Anthracite Lined Oak or Ash Burl. The Range Rover Vogue model offers a highly distinctive new look with unique tailgate badging, reflecting the customer's choice of either the Vogue Silver Pack or Vogue Black Pack. Both derivatives include the widely acclaimed Logic 7, 1200W Harman Kardon High Dynamics Audio System, heated and cooled seats for each passenger, and an 8-inch Dual View infotainment screen - allowing the driver to view the navigation display whilst the passenger can relax watching a video. Additionally, the Vogue Silver Pack offers a Supercharged Design Pack comprising of a bright noble finish to the front grille and side vents. Customers opting for the Vogue Black Pack will sport the Exterior Design Pack. This includes revised front bumper with fog lamp surrounds, front grille and side vents in Titan finish, revised side sills, rear bumper and stainless steel exhaust finishers. The Range Rover Autobiography now comes with three new option packs - Prestige, Dynamic and Technology - which can be ordered individually or in combination to offer customers the ultimate in Range Rover luxury. The Prestige Pack includes extended Autobiography colourways, Grand Black veneers and reclining rear seats; the Dynamic Pack includes the exterior Design Pack with the addition of 20" Shadow Chrome alloy wheels; whilst the Technology Pack comprises Vision Assist, 4-zone air conditioning, the Harmon Kardon Logic 7 1200W audio system and rear seat entertainment. The Range Rover engine line-up remains unchanged for 2012. The powerful 4.4 LR-TDV8 - specifically designed for the Range Rover - develops 313PS at 4,000rpm and 700Nm torque at between 1,500rpm and 3,000rpm. With combined fuel consumption of 30.1mpg, this made it one of the most powerful and economical diesels in the world at its introduction in 2011. Combined with the super-efficient ZF 8HP70 8-speed automatic transmission it returns CO2emissions of just 253g/km. The Supercharged LR-V8 remains one of the most uncompromisingly powerful and efficient petrol engines in its class, producing 510PS at between 6,000rpm and 6,500rpm with torque of 625Nm from 2500rpm-5500rpm. This immense performance, allows the Supercharged Range Rover to accelerate from 0-60mph in a mere 5.9 seconds. The naturally aspirated LR-V8 is one of the most refined engines of its type, combining a silky smooth power delivery with unparalleled efficiency. Power output is 375PS at 6,500rpm with torque of 510Nm at 3,500rpm, reaching 60mph from rest in just 7.2 seconds. 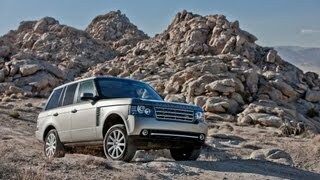 All Range Rover engines conform to EU5 emissions regulations.